General view of Sher Shah Suri's Tomb, Sasaram. bl.uk > Online Gallery Home	> Online exhibitions	> Asia, Pacific and Africa Collections	> General view of Sher Shah Suri's Tomb, Sasaram. 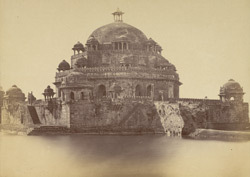 This photograph shows the tomb of Sher Shah Suri at Sasaram taken for the Archaeological Survey of India by Joseph Beglar. This city in Bihar served as the capital for the Suri dynasty between 1530 and 1540 before the move to Delhi for the remaining five years of Suri rule. The red stone tomb was designed by the architect Aliwal Khan and built between 1540 and 1545. It is octagonal in plan and is topped by an impressive dome of 22 metre span surrounded ornamental domed kiosks. It stands at the centre of a lake on a square stone plinth with domed kiosks at each of its corners. The plinth has stone banks and stepped moorings on all sides and is connected to the mainland by a wide stone bridge. Beglar subsequently undertook a thorough restoration of the monument in 1882-3. H. H. Cole, Curator of Ancient Monuments in India, visited the site in 1883, and gives an account of the work, together with sketches, in his annual report (Second Report of the Curator of Ancient Monuments in India, for the year 1882-3 (Calcutta, 1883), Appendix F, pp. xcvii-xcviii).